Roland Thorstensson has taught at Gustavus since 1971. Gustavus Adolphus College Professor of Scandinavian Studies Roland Thorstensson is the latest employee of the College to be honored by the Royal Court of Sweden. Thorstensson will be awarded H.M. (His Majesty) The King’s Medal by the King and Queen of Sweden when he travels to Stockholm in late January. H.M. The King’s Medal was created in 1814 and is presented to Swedish and foreign citizens for special merits as well as to officials of the Royal Court for long and faithful service. Thorstensson has many accomplishments to his name since his arrival at Gustavus in 1971 that qualify him to receive this honor. 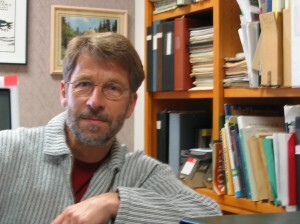 He, along with fellow faculty members Byron Nordstrom and Roger McKnight, helped to develop the unique and nationally respected Scandinavian Studies Department at the College. He helped to create the Out of Scandinavia residency program which brings Nordic writers and artists to campus. He has helped to promote the study of the Sami, the indigenous people of Sweden and Scandinavia. He and his wife Edi created Sjölunden – the first Swedish language village under the Concordia College Language Villages system in 1975 and were its first deans from 1975 to 1977. Recently, he designed a new Semester in Sweden program at Gustavus and served as its first faculty director. Thorstensson is at least the sixth individual affiliated with Gustavus to receive some kind of medal from the Royal Court of Sweden. Past recipients include longtime Vice President for Public Relations and Development Reynold Anderson ’34, Sculptor-in-Residence Paul Granlund ’51, and longtime Director of Food Service Evelyn Young ’33 who were awarded Bicentennial Medal’s from King Carl XVI Gustaf during his visit to the United States in 1976. Several other Gustavus employees have been honored by the Royal Court of Sweden with the Royal Order of the Polar Star, including former presidents Edgar Carlson ’30 and Axel Steuer, and most recently Nordstrom, who received the honor in 2008. The Royal Order of the Polar Star is given to deserving non-Swedish citizens who personally contribute to Sweden’s benefit and to strengthening ties between Sweden and other countries. You and Edi have made a difference in the lives of many and represented Gustavus at the highest level. I guess you could say we were both freshman at Gustavus at the same time and I was fortunate enough to watch your career set educational standards. Congratulations on your award; you’ve made the Gustavus community proud! Wonderful, we in Sweden who collaborate with Roland, we’ll give him a triple hooray, HURRA, HURRA, HURRA!